I came across an interesting article from Time that suggests that smartphones are pushing back against impulse shopping. I'm sympathetic to this argument (see this post), but there is another dimension to the waning of the popularity of magazine purchases at the checkout. In a world full of smartphones, all we need is the headline, and our smartphone will bring us to 20 articles online about that same incident. In other words, more than just distracting us from the magazine, the smartphone is partially replacing it, too. 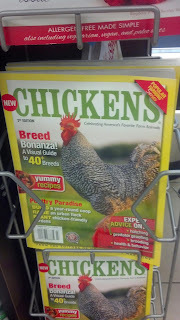 On a different (more comical) note, if you are the supermarket manager, one response to the decline of impulse sales is to sell magazines and products that are not easily replaced by a Google search in the racks - for example, instead of People magazine, Chickens magazine. In all seriousness, I found this magazine in a Chicago supermarket, and because of its novelty, I took a picture... with my smartphone.